In 2015, one of the largest commercial drone developers, DJI, was valued to be worth over US$10billion, while major media companies like Facebook and Google have been quietly acquiring drone manufacturers to further their aspirations of reaching the remaining world's offline population by using high altitude drones to beam down data through lasers, giving those more remote communities a means of getting online. The great thing about drones is that they are small, fast, agile, self-guiding, and can carry things. Ever since Amazon's first patent award for a drone delivery system in April 2015, we have seen new designs emerge and new applications imagined, including the company's latest aspiration to create a blimp style drone carrier which will be able to deploy fleets of drones directly from the sky. Meanwhile companies like Flirtey have received approval for commercial drone delivery flights, for items ranging from Pizza delivery to bottled water, emergency food and first aid kits. Other delivery designs have included life-ring drones, blood-delivery drones, and defibrillator "ambulance" drones – the prototypes of which show great success and clarity of use. In 2015, the world's first Drone Film festival took place in New York, shortly followed by a number of others around the world. 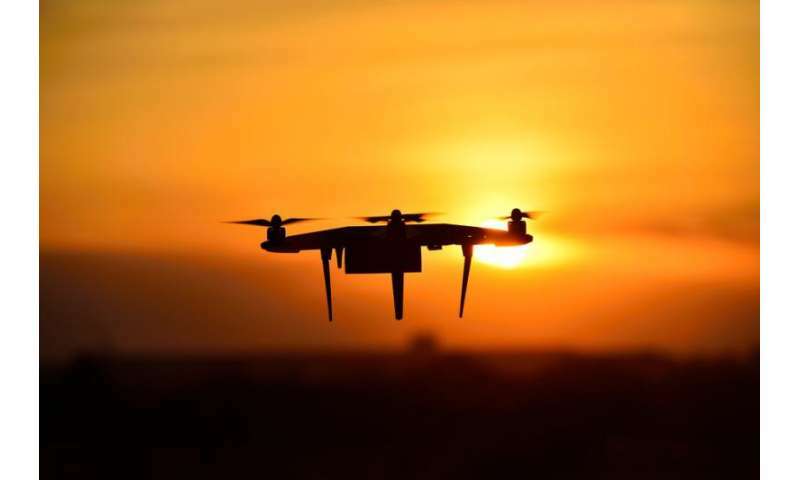 In the same year, the Drones for Good prize launched in Dubai, creating an annual US$1m prize for inventors to come up with some of the best drone applications. Finalists ranged from drones designed to map biodiversity, to a search and rescue drone which was its inaugural international winner. Award winning filmmaker Liam Young created the first film shot entirely by drones, called In the Robot Skies. Artists are even putting 360 cameras onto drones and turning them into virtual reality perspectives, as in the case of award-winning Marshmallow Laser Feast's In the Eyes of the Animal, which uses drones, LIDAR scanning, and VR to give a completely new perspective on the world. The United Arab Emirates created the world's first Grand Prix Drone Racing event, with British teen Luke Banister winning its inaugural event in 2016 with a first prize pot of US$250,000. Since then an entire community of drone races have been popping up around the world, with the first professional race taking place in the UK at the 02 Arena in 2017. Drones also have the extraordinary capacity to occupy parts of our natural world that no other object can. These machines have been seized upon by environmental scientists to help us understand the natural world in ways that have never been possible before. For instance, primate biologist Serge Wich has been monitoring apes from above using a range of drone systems, while Neil Entwistle, of Salford University's School of Environment and Life Sciences, has been mapping out flooding patterns in the UK to more effectively help us figure out how to protect ourselves against catastrophic weather. Among all these amazing applications, there is also a lot of hype about where drones will take us. A lot is still very much in flux. Rules keep changing, freedoms to fly are being curbed in various countries, such as Spain, and there remains a concern about safety and how best to govern accountability. What's more, it's crucial to keep an eye on the links between the military and the consumer sector, as the overlaps are emerging – economically and politically. But one thing is clear, the investment capital is there to sustain these applications for a long time to come and there is no sign of the number of applications diminishing so there's still a great deal of change to expect ahead.